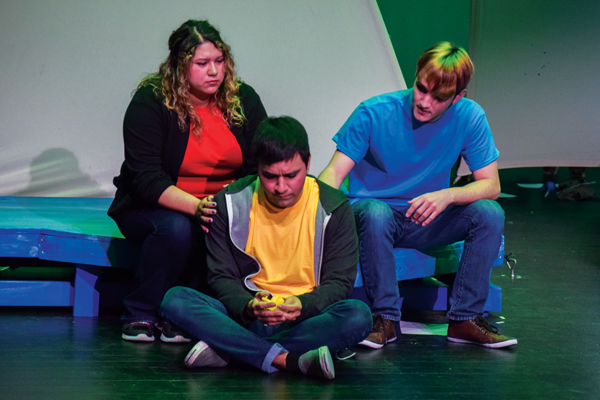 The Harvester Theatre Company’s Dec. 2 performance of David Saar’s “The Yellow Boat” elicited a quasi-emotional response from the audience, but it did not carry the gravity one would expect from a play with such a heavy topic. “The Yellow Boat” is centered around 8-year-old Benjamin, who loves to draw and play pretend games. He is diagnosed with congenital hemophilia as a baby and later contracts HIV, and subsequently AIDS, from a series of blood transfusions intended to combat the effects of his disorder. The play is presented from Benjamin’s perspective and is based on Saar’s son, who died from the same complications in 1987. The substance of the play exists mostly in subtext, which was enhanced by the fantastic lighting and sound work. The use of color and lighting added a whimsical, child-like feel while also representing the progression of Benjamin’s disease. The color red represented the pain Benjamin felt, while the color white represented clinical apathy. At one point, Benjamin uses every color of Crayola ever invented to describe his pain, except for yellow, which represents love and happiness to him. I enjoyed this visual representation of emotion and felt it made Benjamin more relatable. Benjamin’s relationship with color and art is an important one. As his health deteriorates, the world around him begins losing color: white walls, white doctor coats, gray X-rays. 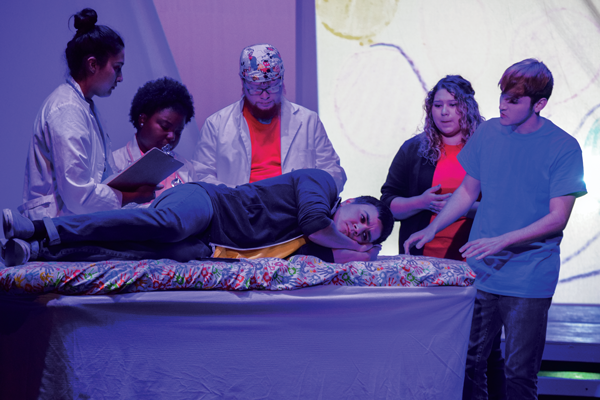 When the play reaches its conclusion, the stage is suddenly lit with a rainbow, showing that Benjamin’s suffering has ended and all the color has returned to his world. Benjamin’s illness is explored through his drawings, which were supplied by 8-year-old Summer Long. The artwork was projected on the middle of the three sails on set and added to the progression of his childhood and illness. There were few props and a static set, but the lighting and sound truly set the scenes. Red and blue lights flash as Benjamin goes to the hospital for treatments, and when he becomes deathly ill, the beep of a cardiac monitor persists in the background. The rapid-fire, overlapping dialogue shows the audience that Benjamin only hears little snippets of conversation. 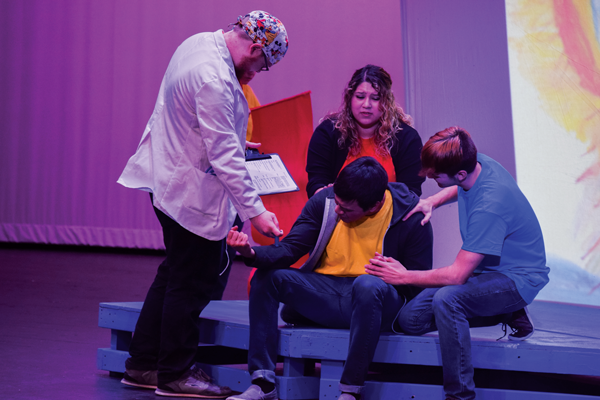 In one scene, his parents stand stage right and discuss how lethargic and sick Benjamin seems while doctors stand stage left, using fragmented sentences and headlines to describe the AIDS cases popping up across the United States. As these lines are thrown out like ammunition, Benjamin sits on the ground, playing with a yellow toy boat. It could have been a very powerful scene and would have evoked an emotional response from me had the lines been delivered with more projection, speed and emotion. Unfortunately, the delivery of the lines meant the play could not reach its full potential. While the play itself is well-written, the performance led to some confusion. The quick exchanges and back-to-back lines were not executed as quickly and loudly as they should have been, which meant some actors had delayed or inaudible lines. There were also projection issues. One character’s lines were almost never audible, and others were very difficult to hear. At times, the actors seemed to be reading directly from a script instead of truly performing, which lessened the impact of the message of the play and dampened the emotional atmosphere that could have otherwise moved the audience to tears. During an exchange between Benjamin and his friend in the hospital, I could see what the intention was, but it all seemed very scripted and inorganic. The powerful story was weighed down by rushed or forgetful acting in many aspects, but I was still confused about a few things when I left the theater, such as what condition Benjamin originally had and the role of several actors.